This range of plug-and-play recessed LED downlights features RGB+W color mixing designed for accent lighting in colored or variable white light. 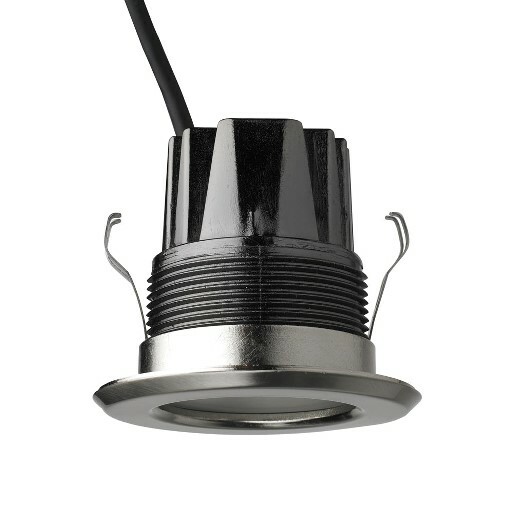 With its tough IP67 rating, the Alien LED Downlight is equally suited to both indoor and outdoor environments. Thermal Cooling: Convection Maximum ambient temperature (Ta max. ): Luminaire 45° C, transformer 40° C Minimum ambient temperature (Ta min. ): Luminaire -25° C, transformer 0° C Maximum surface temperature, steady state, Ta=45° C: Standard luminaire 80° C, high-power luminaire 85° C, transformer 70° C Total heat dissipation per head (i.e. one high-power or two standard luminaires), calculated, +/- 10%: 62 BTU/hr.